Watch an introductory video to know more about the actions we take. 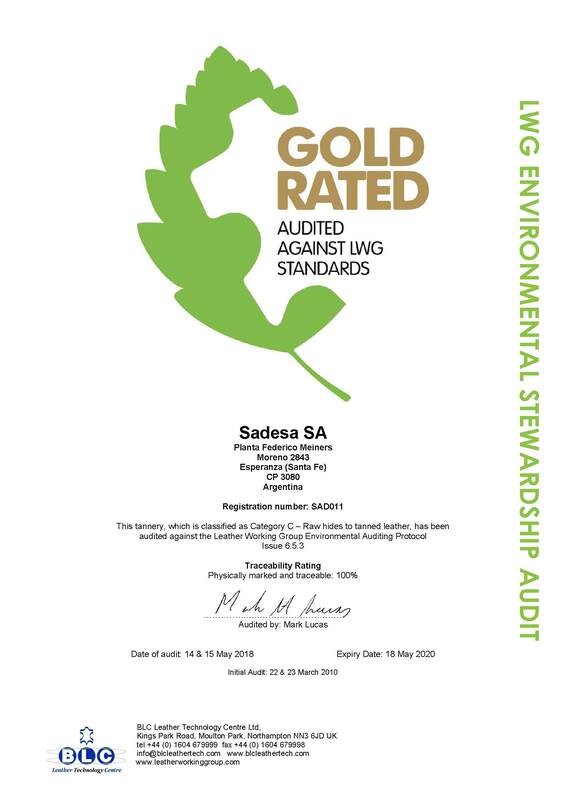 At Sadesa, we believe that the protection of the environment concerns all of us and that we will achieve better results establishing relationships with other industry players. That is why Sadesa joined the Leather Working Group, a multi-disciplinary group, supported by BLC Leather Technology Centre and integrated by the major footwear brands and tanneries in the word. Sadesa operates under strict local and international environmental standards and is periodically subjected to rigorous audits carried out by recognized organisms. 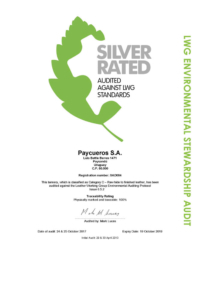 As a result, we have been awarded with a large amount of certifications that support our commitment to the environment. State of the art technology used in our drums to reduce water consumption vs traditional use. New generation of retanning drums using less water. Special filtering that separates solids avoiding washes that consume unnecessary clean water. Recycling of water used in the tanning process. Recycling of water of the treatment plants for new uses (cleaning, industrial processes, etc). All our plants treat their effluents to fully comply with local and international environmental regulations. Continuous investments are made in the construction and maintenance of state-of-the-art Water Waste Treatment Plants in each of the industrial facilities. These plants process effluents used during production in order to purify them, this way avoiding damage to the natural watercourses where they are poured. 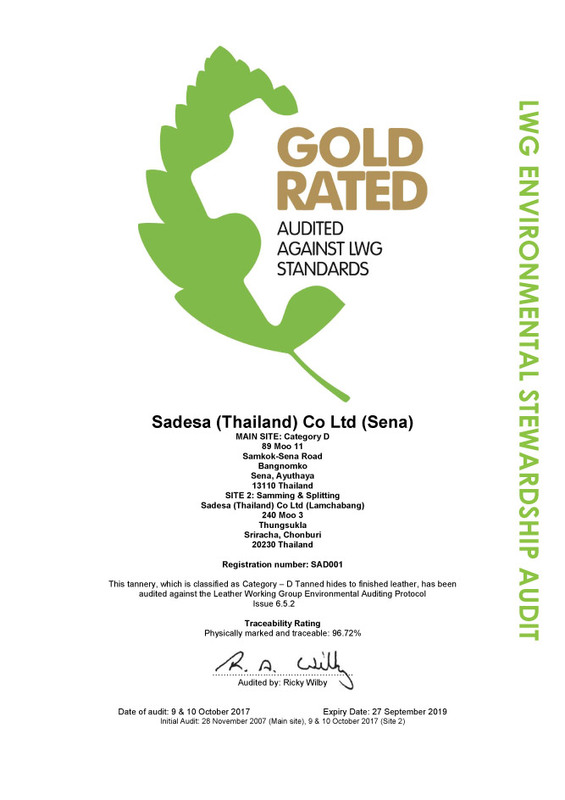 SADESA has a deep respect for the environment. For this reason continuous investments are made in the construction and maintenance of state-of-the-art Water Waste Treatment Plants in each of the industrial facilities. All of SADESA’s plants treat their effluents to fully comply with local and international environmental regulations. SADESA has a state-of-the-art plant for its Federico Meiners facility in Esperanza, Argentina, at a cost of eight million U.S. dollars. This plant was built in association with the town council of Esperanza and other private companies. It was constructed with French know-how, following strict local and European standards.  Lomas de Zamora industrial facility in Buenos Aires has a fully operational Plant since 2001. Paycueros industrial facility in Paysandu has a state-of-the-art plant with an investment of 4 million dollars. In addition, we have already concluded a specific area for solid waste disposal. The Asuncion Vernon plant is fully operational, with a treatment capacity of over 1.800.000 liters of effluents per day. Both Sena and Kabinburi plants have fully operative water treatment plants. As one of the largest tanning groups in the world, Sadesa assumes total responsibility to prevent and minimize negative impacts on the environment. With that purpose significant investments in infrastructure, research and human resources are made, as well as a rigorous controls of substances used during production processes. Sadesa assigns 25 percent of its investments to environmental protection, resulting in a total amount of 25 million U.S. dollars during the last 10 years. All Sadesa’s industrial facilities operate under a rigorous environmental protection system, which include state-of-the-art water treatment plants at high maintenance operational costs. According to analyses performed by BLC Leather Technology Centre, different tanning agents, like chrome, vegetal and aldehyde all have the same environmental impact. These studies have also shown that a significant part of the environmental impact of leathers is defined by the manufacturing process, rather than by the tanning agent used during production. Sadesa uses chrome III during its production processes, which not only is not toxic, but constitutes an indispensable element in human diet based on normal glucose, protein and fat metabolism characteristics. In addition, Sadesa takes all necessary precautions during each stage of the process, for example, use of chromium recovering and recycling system in all the tanneries that process skins from the raw material stage. Through a rigorous Policy of Restricted Substances, Sadesa supports the limiting of use of environmentally harmful substances in the processing of its products in order to protect the environment. Our customers and suppliers are expected to assist us to achieve the objective of full compliance with the restrictions on harmful substances listed in the Policy and any other products which may be restricted now or in the future in all countries we do business. 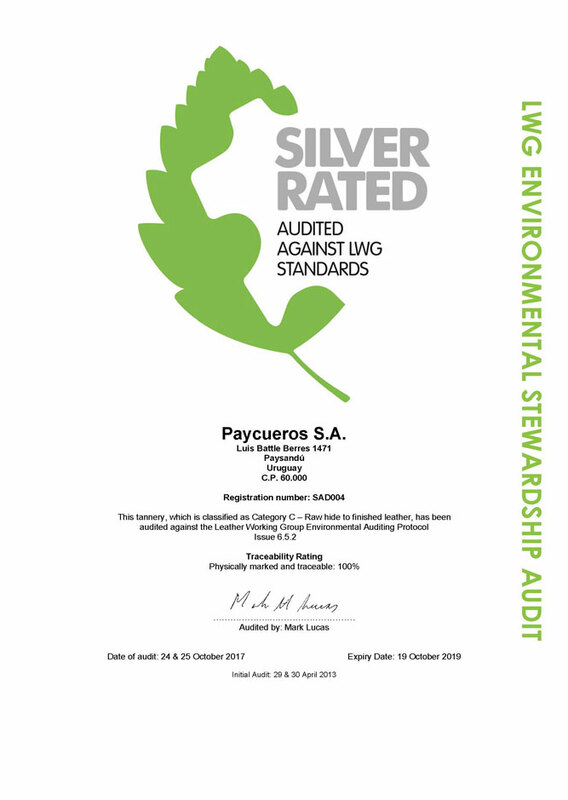 LWG GOLD Environmental Certificate awarded by BLC Leather Technology Centre. Environmental Aptitude Certificate from the Environmental Policy Department of Santa Fe Province Government. 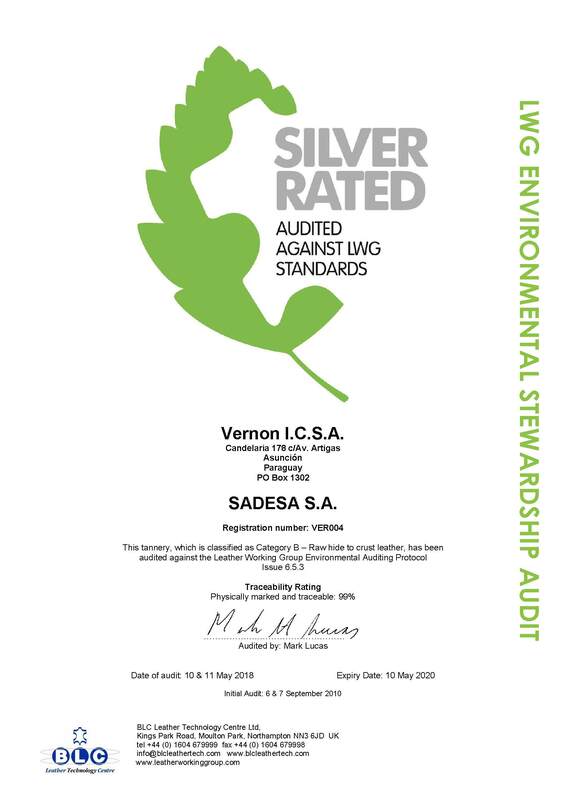 LWG SILVER Environmental Certificate awarded by BLC Leather Technology Centre. Environmental Aptitude Certificate from the Environmental Policy Department of the Buenos Aires Province Government. That is why Sadesa have joined the Leather Working Group, a multi-disciplinary group, supported by BLC Leather Technology Centre and integrated by the major footwear brands and tanneries in the word. The objective of this organization is to develop and maintain a protocol that assesses the compliance and environmental performance of tanners and promotes sustainable and appropriate environmental business practices within the footwear/leather industry. Within this framework, Sadesa is the fist tannery worldwide to be awarded with the Gold Environmental Certificate by the Leather Working Group in its Thailand plant. Federico Meiners facility has also scored for the Gold Certificate in most aspects, but Silver on renewable energy consumption. These significant awards reflect our commitment to the environment and give us enthusiasm to continue working on this important issue. Sadesa makes important efforts to produce less waste by applying the 3 Rs of waste management. Recycling enables new utilization of materials that are used in our production process and thus minimize their environmental impact. Another method that Sadesa uses to contribute to environmental protection refers to the reduction of consumption from natural sources such as water and energy. 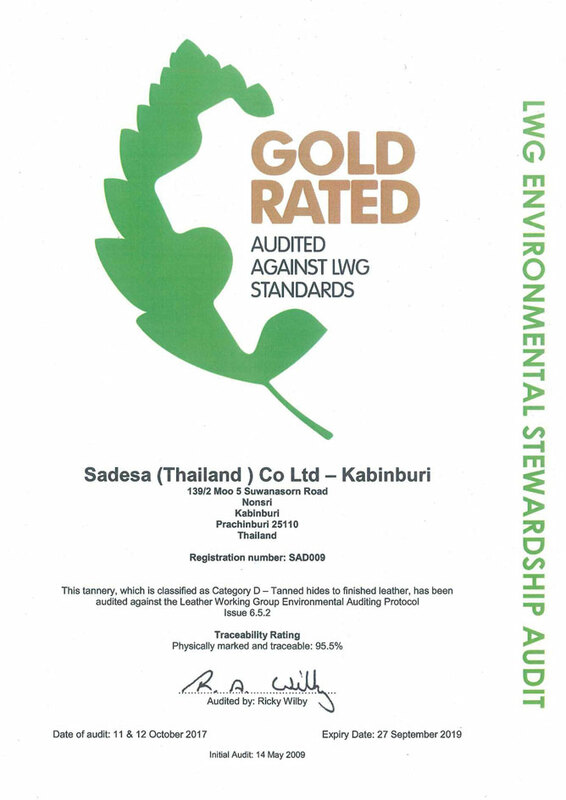 Sadesa’s industrial procedures have helped to reduce water and energy consumption. All Sadesa’s plants recycle the water used in vacuum dryers and cooling systems, which contribute strongly to energy savings. In addition, and in order to reduce the emissions of C02 and prevent the climate change, Sadesa has always used Biomass for steam generation at Uruguay and Argentina facilities and has recently begun to use bio-fuel (renewable carbon) in Paraguay. The implementation of this method is intended to be applied in other sites. Creating new uses for our by-products is also helping to reduce waste and protect the environment. Fleshings, splits, shavings, leather scrap, hair, are today used in different ways by other industries. Gelatine, fertilizers, bonded leather, crust and finished splits are some of the uses given to these by-products. Sadesa is fully committed to responsible environmental protection through its Environmental Policy.